Broadside: He Mau Olelo Hoakaka no ko maua noho ana. July 5, 1832. 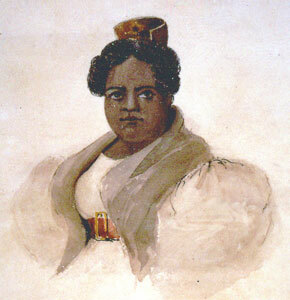 Kīna‘u succeeded her aunt Ka‘ahumanu upon the latter’s death in 1832. Her term of office was marked by discord as the young King Kamehameha III, her half-brother, struggled with her and the chiefs for political power. She was responsible for enforcing Hawai‘i’s first penal code, proclaimed by the King in 1835. Kīna‘u became a Christian in 1830, and was involved in the persecution of Hawaiian Catholics and attempts to expel French priests. This contributed to a diplomatic confrontation with France that threatened Hawaiian sovereignty. Kaheiheimālie was a sister of Ka‘ahumanu, making Kīna‘u one of Ka‘ahumanu’s closest relatives and heirs. Luanu‘u Kāhalai‘a (1825-1826) – when Liholiho left for England, he gave Kīna‘u to Kāhalai‘a. Mataio Kekūanāo‘a (1827- 1839) – having accompanied Liholiho to England, upon his return he was entitled to a “gift” for his services. Kāhalai‘a having died in 1826, Kekūanāo‘a asked for Kīna‘u.